Celebrate humanity's diverse expressions of power and divinity with these mystical symbols from around the world. 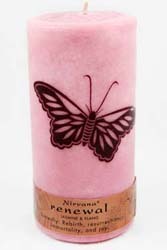 These luxuriously scented Jasmine & Ylang Ylang candles by Nirvana burn for a whopping 120 hours. This one is for rebirth, resurrection, immortality, and joy. It has a beautiful butterfly infused into the wax.